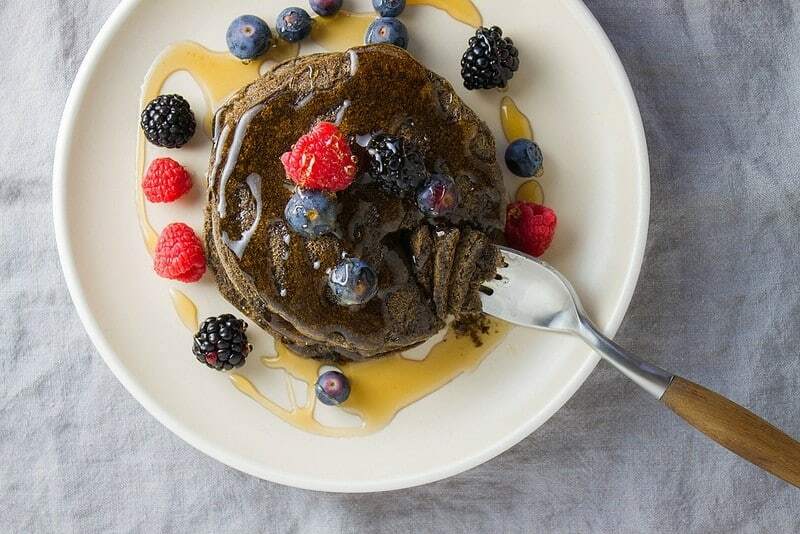 Made from scratch, this vegan buckwheat pancakes recipe is super easy to make and yields hearty, thick and fluffy pancakes. They are a new favorite and I think you’ll love them too! Buckwheat has been one of my favorite flours of late and making pancakes with it has been on my to-do list. Despite its name, buckwheat flour isn’t wheat, but is actually a seed, making it a healthy, nutritious and naturally gluten-free alternative to all-purpose and whole-wheat flour. 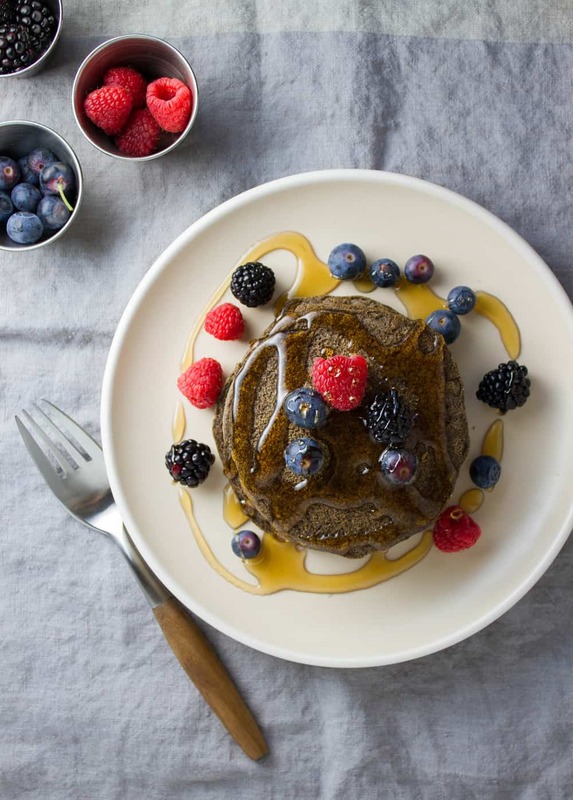 What Do Buckwheat Pancakes Taste Like? Buckwheat flour has a delicious nutty flavor and grainier texture than regular flour. The graininess is only slightly noticeable and not unpleasant at all. It also cooks up darker than most flours making it look chocolatey. You can use buckwheat flour in place of regular flour in a ratio of 1 to 1. There is no guessing, simply replace the flour called for in most recipes with buckwheat flour. If you haven’t tried buckwheat flour yet, hopefully this will give you some encouragement. And for further encouragement, you may like to try these other buckwheat recipes. This Buckwheat Banana Bread and Buckwheat Chocolate Waffles are both seriously delicious! 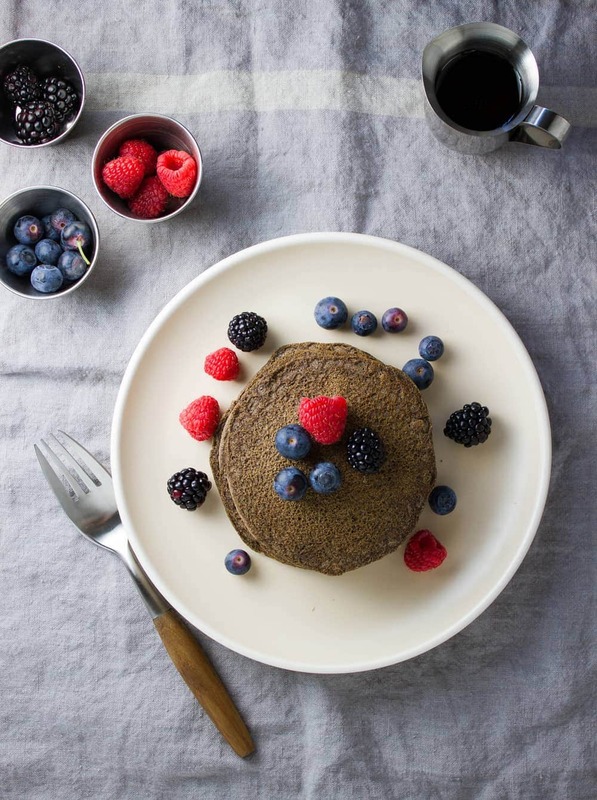 Making buckwheat pancakes is super easy! For the ‘buttermilk’, simply add the juice of 1/2 lemon (or 1 teaspoon apple cider vinegar) to one cup of non-dairy milk and let set for 10 minutes. There you have it, vegan buttermilk. Easy and delicious! Mix the buckwheat flour, sugar, baking soda, cinnamon and salt together. Add in the vegan buttermilk and mix to combine. These are thicker pancakes, for thinner pancakes, add a tad more milk to the batter. Using a 1/4 cup measuring cup, scoop up batter and place on griddle. Once the top forms bubbles and sides look a little leathery, about 2 – 3 minutes, flip and cook the other side for 2 -3 minutes. Top your vegan buckwheat pancakes with any one kind or combination of blueberries, raspberries, blackberries or strawberries. The berries the better. My favorite berry here was the raspberries, they were perfectly ripe and flavorful adding just the right touch. You may even like to top with this Blueberry Compote (it’s really easy to make and delicious!). And that’s it, moist, fluffy, and ultra healthy vegan buckwheat pancakes. Wether for breakfast, lunch or dinner, pancakes make a great meal. Take a look at these other vegan pancake recipe, you may find a new favorite! See all Pancake recipes on TSV! 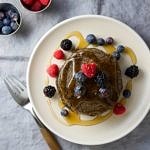 Thick, fluffy, delicious and nutritious, make it a good morning with these vegan buttermilk buckwheat pancakes! Buttermilk: In a measuring cup, add milk and lemon juice, let set for 10 minutes. Preheat griddle to manufacturers setting for pancakes. Once hot add 1 tablespoon or so of coconut oil and spread to coat griddle. Mix: In a medium sized mixing bowl, add flour, sugar, baking soda, cinnamon and salt, mix well. Add in vegan buttermilk and mix to combine. These are thicker pancakes, for thinner pancakes, add up to 1/4 cup more milk to the batter. 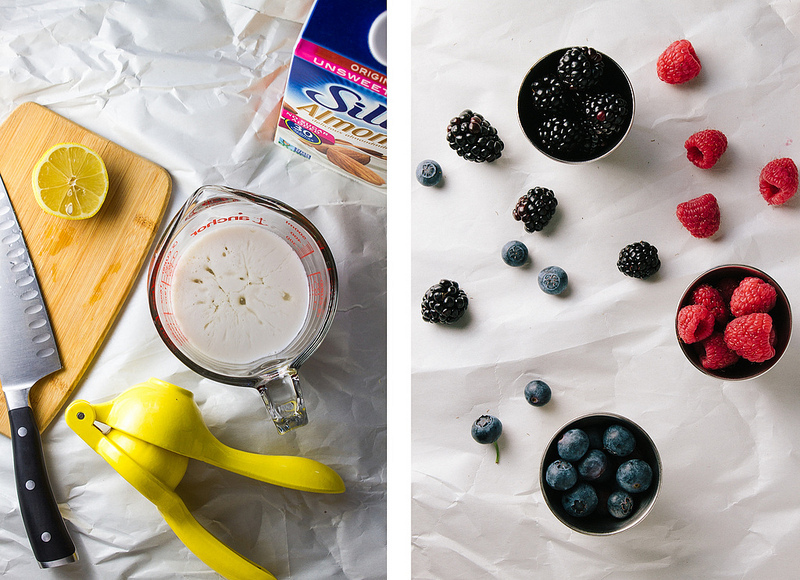 Pour and cook: Using a 1/4 cup measuring cup, scoop up batter and place on griddle. Once the top forms bubbles and sides look a little leathery, about 2 – 3 minutes, flip and cook the other side for 2 -3 minutes. Serve with berries of choice and pure maple syrup. You may even like to top with this Blueberry Compote (it’s really easy to make and delicious!). Makes 8 pancakes. Serves 2 generously or 4 smaller plates. Add in 2 teaspoons of vanilla extract if you like. Any amount less than that won’t be very noticeable.